First off, a progress report on Charley Harper. I am nearly there (although of course that probably means two weeks off, or four, given the time of year). He is out of the hoop, and I am working on all the bits right around the edges - my least favourite part of quilting. After that, the binding, another job I'm not so keen on, but I am keen to see him finished, so I am trying just to relax and keep stitching. As we rush headlong towards Christmas stitching time is diminishing, but I have a day of sitting around in a hospital on Wednesday (not for me; I'm the moral support), so am hoping that this at least will get some attention this week. Otherwise I have a lorry load of food to organise before large children descend, plus all the stuff everyone reading probably has to cover too, but I have my Christmas cds out now, plenty of tinsel and I'm comfortably in my Christmas groove. Joining Kathy for Slow Sunday Stitching - one of my favourite linky parties. Loving Charlie! All my sewing and shopping are done and I am working on cards and wrapping...trying to just enjoy the process. The denim piece looks to be hard on the fingers! I love this work of you. Have to try it soon. Hehe.... 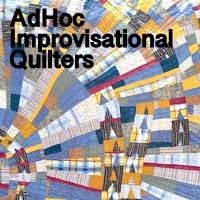 I kept thinking of my hubby's Uncle who shares the name of your quilt! Great job and hope you get everything done in time. Some great magic happening at your house too! Enjoy those stitches! Your quilt looks lovely! Your denim piece looks like a fun project. Enjoy your day! Lovely stitching on Charley Harper and love that denim project. Love both of these projects! Enjoy your stitching time, even if it is short! Really adore your big stitch quilting Kaja! Especially those orangey scarps against the denim and with the raspberry stitching! Charlie Harper is coming along beautifully too. I am just recently starting to learn to like hand stitching. Still messy, but relaxing to do. Glad you got your Christmas groove on! Glad I can be of use. I'd rather have some immoral support, it might make the day more fun! Oooh, exciting progress Kaja! Love the orange scraps on the denim too - my favourite colour so I guess I would, ha! I'm still not really feeling the Christmas vibe yet, too much panicking going on...can I have some of yours?! I'm getting in the groove as well :) Interesting project with denim. What are you making? Ahh, Christmas music, sewing and big kids on the way....now that's how to spend Christmas. Hope yours is merry and bright. I would be hard pressed to decide which I like more: the oranges or the reds. They are both so cheerful. As for Charlie Harper, perhaps the first post of the new year will be the finished project. You're very close!